One of my favorite things to do is organize. Yes, I said it! I get excited at the thought of a neatly organized space and my classroom is no different. I know how hard it is for me to be creative in a disorganized space which is why I try to keep a very organized classroom. I’ve read many blog posts about organizing an art room and thought I’d share a few things I do when it comes to paint…tempera paint. Through the years I have found a system and products that work for me in my classroom. I have tried various brands and types of paints, various means of distributing the paints and many ways of cleaning up after. This is what works for me. 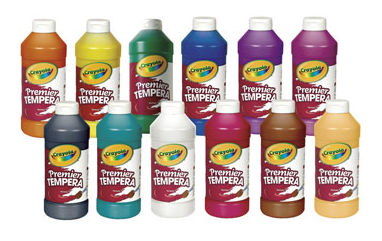 My favorite brand of tempera paints is Crayola Premier Tempera in 32 oz containers. The paint is thick and smooth! I like the 32oz size as they fit perfectly inside my cabinets and are easy to squeeze. My room has limited storage and counter space so this size works best. I’ve never liked squeezing paint onto a “palette” (paper plate, plastic food top, mixing tray, etc) for dispensing the kiddos every time we paint because it seems as though a lot of paint is wasted that way. 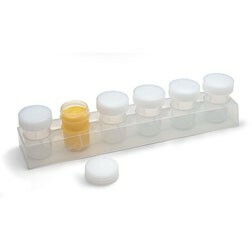 My second year teaching I found these great 6 set containers from Nasco that I dispense with what I call my “rainbow colors” (red, orange, yellow, green, blue, purple.) I fill them half way up and when they get low, I fill them again. It’s great because some colors get used more frequently and then I can fill them as needed. I’ve trained the kids to be extra careful about forgetting to clean their brush and dipping into a different color. If one color does get contaminated, and it’s usually yellow, you can cap all the other colors and rinse out just the yellow to clean and refill. It’s awesome!!! I have had the same set of these plastic containers for 8 years now! About once per year (usually at the end of the year) I take the containers home and soak them in hot, water with a little bleach. I’ve even put them face down in the dishwasher, place the caps in the utensil basket, and give them a whirl. They come out fantastic AND they don’t melt or loose their shape. When we need black, white, or brown I use Sax art cups with tops. They work great and keep the paint moist. I also like these because when the white gets too contaminated, I can just do a quick rinse and add more. I only add a small squeeze of paint into these containers and refill when needed. These are also great for premixed colors that you may use with some of your younger students. 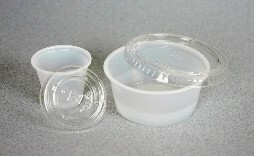 I know many people have used empty yogurt cups or food cups; but these are small and all the same size. As someone who doesn’t have much storage space in my classroom, having the uniformity of size helps keep it organized. When we hand out these cups, I use a disposable Solo plastic plate as the tray. They are cheap and reusable an easy for small hands to hold. 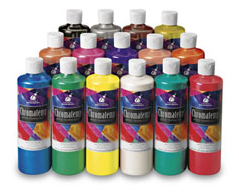 Another paint that I discovered at the NAEA conference last year was Chromatemp Pearlescent Tempera paints. The kids LOVE anything with shimmer! Certain projects look fantastic with a little shine! This set has 15 different colors to use from the “rainbow” colors to metallics to neutrals. I put this paint into the cups with the tops as needed. Since there are so many choices in this set, I can give different classes working on the same project a couple different color palettes. So “Classroom A” will have these 6 to use while “Classroom B” may have these other 6 to use. It allows each class to have a little different looking project without giving each table 15 colors to use. 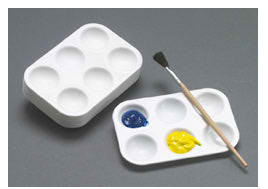 We use these small 6-cup trays for mixing paint. The room had a large set of them when I first started and they are great. When it’s time to clean up, I have the kids place the mixing trays in a bucket of hot, soapy water to soak and the paint just slides off. I can let them soak until I can get to clean them. Actually the longer they soak; the easier they are to clean. That’s how I organize painting with tempera in my classroom. It’s simple, efficient and works for my space. How do you organize your Tempera paints in your classroom? What is your favorite brand of paint to use?